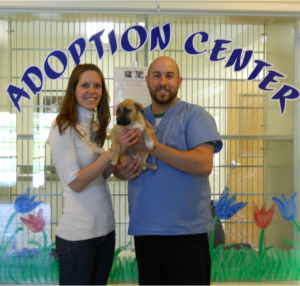 Our last litter of Anguillan pups found their forever homes so fast, Dr. Civic decided to bring back another! In February of 2011, Dr. Civic brought back a litter of three adorable puppies from Anguilla. The response from our clients was wonderful– in just a few short weeks they were each adopted by loving families. 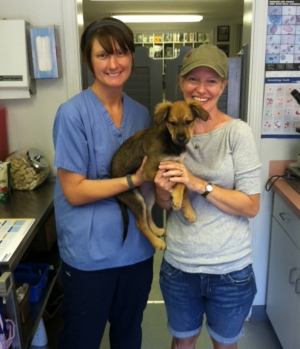 Dr. Civic knew there were many more puppies in need, so he made arrangements for another flight right away! These next five puppies were just as sweet, playful and adorable as their cousins! 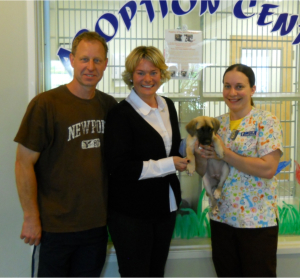 “Frank”, “Susie”, “Madeline”, “Lisa” and “Joanie” are the third litter of “coconut retrievers” to find forever homes here in New England, thanks to the partnership between the AARF and Newport Animal Hospital. You can read their story in our letter to the AARF, below! Once again, we have good news to share with you regarding the newest group of puppies that Dr. Civic brought to us from AARF! After our success with the last three puppies, we were all excited to find homes for our five new friends, “Frank”, “Lisa”, “Joanie”, “Madeline” and “Susie”. We weren’t sure anyone could top the last batch of pups we had, but this new group quickly won us over! The quietest one of the bunch, “Lisa” was the first to find a home. She was the smallest of the puppies, with a very sweet and calm disposition. Like any puppy, she loved to play and run around with her littermates, but she was just as eager to jump into our laps and snuggle with her human friends. Lisa – now named “Millie” – caught the eye of Mr. and Mrs. Fecteau. After fostering Lisa for a weekend, Mrs. Fecteau knew that she wanted her for keeps, and our littlest puppy couldn’t be happier with her new family. “Susie” quickly proved herself to be the spunky and rambunctious one of the group. She always seemed to be most excited about her trips outside to the play yard, jumping right into our arms whenever we opened the door to her kennel. She loved to run around outside, and seemed to have limitless amounts of energy! Susie’s new owner, Julie Batcho, came into the animal hospital to buy food for her cat when she saw the puppies playing in our adoption room. Julie had been preparing to adopt a puppy for over a year, and once she spent time with Susie, she quickly fell in love. Now called “Dory”, she accompanies Julie to work every day, where all employees’ dogs are welcome! She certainly will have plenty of new playmates to keep her busy! With her blue eyes and light markings, “Madeline” was the most visually striking of all the puppies and it seemed like everyone who came in to see them noticed her first. “Maddy” was scrappy and feisty, and was always ready for playtime with her littermates! Jaime Viti and her family could not resist Maddy’s playfulness and could not wait to take her home to give her plenty of room to stretch her legs! 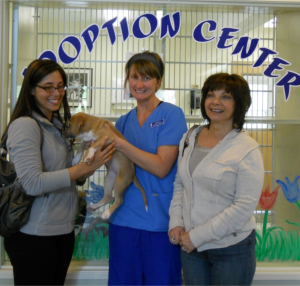 Jaime was so excited when she came in to take home Madeline, and we know that Maddy is going to have a great life with her new best friend! 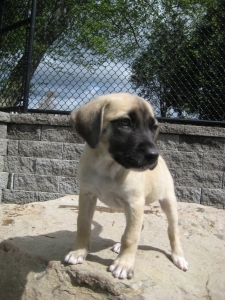 “Joanie” was a very loving and adorable little pup and was the most independent of the group. While she loved running around with the other puppies, she was just as happy to go off exploring on her own. It was a common sight to see Joanie laying down quietly chewing on a stick or a leaf while the rest of her friends were busy rolling around and jumping all over each other! Mr. and Mrs. Brown loved her quiet demeanor, and were excited to provide a loving home to the sweet little puppy, who they re-named “Josie”. As first-time puppy owners, the Browns had lots of great questions for us, and we are certain they are going to provide Josie a happy and loving home. “Frank” was the Velcro-puppy of the group, quickly attaching himself to any of the staff who came to visit him, always darting between our legs whenever we took him outside to play. He was also our most vocal, never hesitating to let us know when he wanted some extra attention! It’s never easy for us to see the last puppy in a group all alone after its friends have left, but the Norris family came in for a visit and luckily found Frank waiting for them! Mr. and Mrs. Norris and their children were beside themselves with excitement over meeting the little guy, and Frank was not hesitant in matching their enthusiasm. A home with young children is the perfect one for Frank, who will always have a playmate not too far away! Once again, thank you very much from the entire staff here at Newport Animal Hospital. While caring for a group of young puppies takes a lot of patience and dedication, everyone here pitched in and lent a hand to ensure that each puppy was loved well, cared for, and placed in happy homes with their wonderful new families. Again, you will find enclosed a donation from each of our adopting families to assist in your efforts in rescuing and caring for pets in need in Anguilla. We truly appreciate the work you do, and it is our pleasure to lend our assistance where we can. Thank you again for everything, and best of luck to you all!